Welcome to hard drive recovery Toronto where we can recover your important documents, files, pictures, videos, music/audio files when your computer hard drive, server drive, external hard drive, USB flash key, Raid array, Solid State Drive (SSD), Mac drive, Laptop drive, Camcorder storage and SD card stopped working. We have extensive experience and state of the art technology. 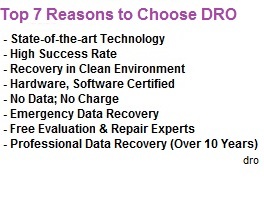 We recover data in dust-free environment. We have successfully recovered data from internal or external hard disks, USB flash drives, SSD disks, SD Cards, Video camera hard drives and all other disks. We offer quick free estimates. We also offer free pickup within GTA.